Control the absolute pressure (referenced to vacuum) or gauge pressure (referenced to local barometric pressure) of gases or liquids in your process. Alicat’s PCD series dual-valve pressure controllers use two proportional valves to precisely control the pressure of gases within closed or dead-ended volumes. They achieve new setpoints rapidly and stay put, even in the face of uneven feed pressure or changing temperatures. We’ll use your application parameters to customize your valve and PID tuning to ensure that your controller delivers fast and stable control. Efficient. The dual-valve design incorporates a second proportional valve to exhaust excess pressure, but only when needed to maintain your setpoint. This eliminates the need to continuously bleed costly gas. Compatible gas media: all non-corrosive gases (PCD/PCDS). Liquids and corrosive gases require an S-series device (PCDS). If you would to like to use your own vacuum or pressure sensor, the PCD-EXTSEN pressure controller is built without an internal pressure sensor. Instead, it connects electronically to a customer-supplied external pressure or vacuum transducer via the dedicated industrial sensor connector (ISC) located on top of the pressure controller. This configuration is especially useful for vacuum coating processes. Instruments in the standard PCD series are also available with an optional “S” configuration (PCDS) for use with liquids and corrosive gases. In this configuration, we upgrade the valves to 303 stainless steel, the sensor to 316L stainless steel and the elastomers to FFKM. Some corrosive gases require 316L stainless steel throughout the flow path, and in this case we can upgrade both the valves (type PCA) and flow body to 316L for full-scale flow ranges of 20 slpm or less. Alicat’s PCD series uses small proportional valves for control at lower flow rates and is suitable for use with non-corrosive gases. Alicat’s PCDP series offers the largest orifice in a small valve format and is suitable for use with non-corrosive gases. Alicat’s PCDH series pairs two small valves working side-by-side as one and is suitable for use with non-corrosive gases. Alicat’s PCRD series uses nearly frictionless Rolamite valves and a variety of orifice patterns for control at high flow rates and is suitable for use with non-corrosive gases. 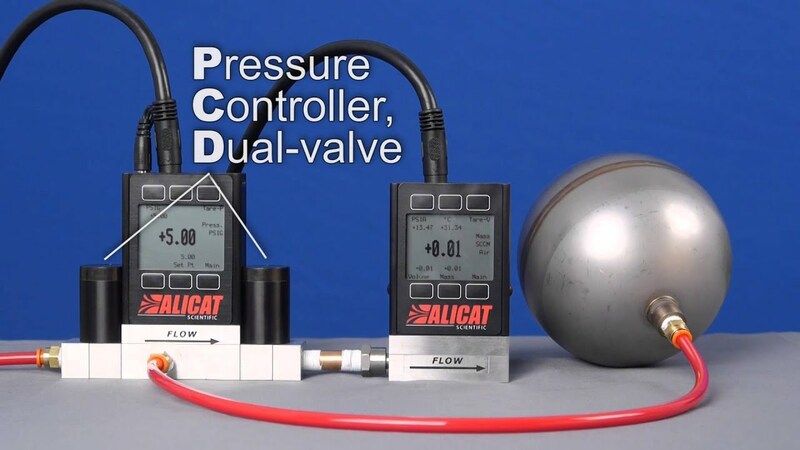 Alicat’s PCDHS series is suitable for use with liquids and corrosive gases and pairs two valves working side-by-side as one to provide greater control at higher pressures. Alicat’s PCRDS series is suitable for use with liquids and corrosive gases and uses nearly frictionless Rolamite valves and a variety of orifice patterns for control at high flow rates. Establish precise control of fluid dispensing by controlling the pressure in the head space above the liquid. The dual-valve pressure controller maintains a constant pressure in the head space with minimal outgassing of excess gases.